Summary and Definition: The 'Fireside Chats' was the informal name given to the series radio broadcasts that President Franklin D. Roosevelt gave as a means of direct communication with the American public. When FDR was inaugurated as President the nation was in the grips of the Great Depression. Republican President Hoover had failed to take effective measures to help the American people and was perceived as being insensitive. The mood of the nation was sour and FDR knew that he had to inspire confidence and hope in Americans. It was vital to communicate the sweeping changes of the New Deal and the radio provided a perfect medium for talking directly to Americans in the comfort of their own homes. The first of the radio 'Fireside Chats' was broadcast on Sunday evening, March 12, 1933 and 60 million people tuned in to hear the new president. FDR made a total of 30 evening radio addresses, called the 'fireside chats' between 1933 and 1944. The 'Fireside Chats' were used sparingly, often in times of crisis, ensuring the importance of the president's radio addresses to the American nation. 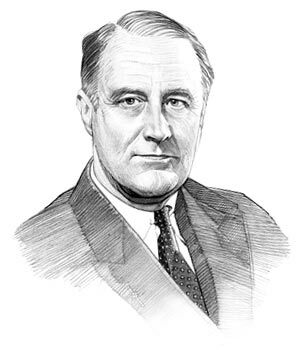 Franklin D Roosevelt was the 32nd American President who served in office from March 4, 1933 to April 12, 1945. One of the important events during his presidency was his direct method of radio communication with Americans called the Fireside Chats. Fast, fun facts, Frequently Asked Questions (FAQ's) about the Fireside Chats. What were the Fireside Chats? The Fireside Chats were a series of thirty important radio broadcasts made by Franklin D. Roosevelt as a means to directly talk to Americans in times of crisis and national importance. What was the Purpose of the Fireside Chats? The purpose of the Fireside Chats was to convey important information and reassure Americans during difficult times of the Great Depression and WW2. When did FDR make his Fireside Chats? FDR made his Fireside Chats in times of national crisis and importance. He broadcast a total of 30 fireside chats between 1933 and 1944. They ended with his untimely death on April 12, 1945. Where did the Fireside Chats take place? The majority of broadcasts of the Fireside Chats were made from the White House but a few of his 'Fireside Chats' were also made from Hyde Park. Why were the Fireside Chats important? The significance and impact of the Fireside Chats should not be under estimated. The Fireside Chats provided immediate access to the population, relayed important information, inspired confidence and patriotism, conveyed a personal touch and increased the popularity of FDR. The Fireside Chats allowed the president to speak directly to the people reducing the control of Conservative dominated newspapers gaining public approval of FDR’s actions and initiatives and Democratic ideals and principles. The following fact sheet contains interesting facts and information on Fireside Chats for kids. Fireside Chats Fact 1: The radio was still a relative novelty. The first radio broadcast was made by KDKA from the Westinghouse Electric buildings on Tuesday, November 2, 1920. By the end of the 1920s there were over 100 million radios in use in America. When Franklin Roosevelt assumed the presidency about 65% of Americans had access to the radio and FDR used the medium for his Fireside Chats. For history and facts refer American Radio History. Fireside Chats Fact 2: Before FDR, all the US Presidents had communicated with the American people through newspapers. The advent of radio allowed FDR to reduce the power of the press that was governed by their editorial policies. Many expressed Republican views and were quick to criticize the Democrat president - the 'fireside chats' allowed FDR to address any concerns. The Fireside Chats enabled him to directly express the reasons for his policies, actions and initiatives using a highly personal and "down-to-earth" approach with words that everyone could understand, but were never condescending. Fireside Chats Fact 3: The radio broadcasts were a perfect communication vehicle for FDR, who was an excellent orator. He had a calm, reassuring voice and this, together with his confident, reasoned, determined, fearless approach, inspired Americans with "courage and confidence" during periods of national crisis. He was able to gain popular support for his actions and became one of the most popular presidents in the history of the United States. Fireside Chats Fact 4: The introduction of the radio was fortuitous for President Roosevelt enabling him to communicate directly with millions of Americans via his Fireside Chats. The radio was especially convenient for FDR because it enabled him to hide his polio symptoms from the public eye. Many had observed that had Roosevelt run for the presidency in modern times he would never have been elected president. Fireside Chats Fact 5: Although the fireside chats sounded relaxed and informal, the impact and content of his broadcasts were shrewdly calculated to ensure they had the maximum effect. Fireside Chats Fact 6: The timing of the fireside chats was crucial. The broadcasts were always made in the evening and timed for when people had finished their dinner and were relaxed and settling down in their living rooms to listen to their favorite radio programs. Fireside Chats Fact 7: President Roosevelt ended his Fireside Chats with a reference to the help of God or Providence, urging Americans to face the difficult tasks ahead with faith, patience, courage and understanding. Fireside Chats Fact 8: “The Star Spangled Banner” was played at the end of every broadcast, underlining the role of every American during hard times and the highly patriotic message of the lyrics. Refer to the Meaning Lyrics of Star Spangled Banner. Fireside Chats Fact 10: In his first 'fireside chat' FDR explained to the American people why he declared a National Bank Holiday - and temporarily closed all the banks.. It was the start of the measures that the president would adopt during FDR's First Hundred Days. When the banks reopened the following day on Monday 13 March, 1933, people demonstrated their belief and confidence in FDR by making more deposits than withdrawals and the Banking Crisis was over. Fireside Chats Fact 11: On Sunday, May 7, 1933 President Roosevelt outlined the New Deal Program based on three simple headings - Relief, Recovery and Reform. On Monday, July 24, 1933 President Roosevelt described the Purposes and Foundations of the New Deal Recovery Program. The following fact sheet continues with facts about Fireside Chats for kids. Fireside Chats Fact 12: President Roosevelt would give over 30 informal fireside chats during his presidency. He made numerous other more formal speeches using the other conventional methods of communication but the 'Fireside Chats' were special events and reserved for difficult times of national crisis. The most important 'Fireside Chats' are detailed below. Fireside Chats Fact 13: On Sunday, April 28, 1935 he provided the Works Relief Program aimed at relieving unemployment and addressing the plight of poverty-stricken Americans. Refer to the List of FDR New Deal Programs. Fireside Chats Fact 14: On Sunday, September 6, 1936 President Roosevelt reported on the Drought Conditions. A series of terrible droughts had hit the nation resulting in the Black Blizzards that contributed to the devastation of 100 million acres of farming land in the prairie states and the destitution of the farmers in the Dust Bowl. Fireside Chats Fact 15: On Sunday, November 14, 1937 President Roosevelt reported on the Unemployment Census and the impact and effects of the New Deal Programs. Fireside Chats Fact 16: On Sunday, September 3, 1939 FDR addressed the nation on the subject of the war in Europe and followed this on Sunday, May 26, 1940 by another of his Fireside Chats on National Defense. Fireside Chats Fact 17: FDR continued the theme of National Security on Sunday, December 29, 1940 and explained that neutral America must be "must be the great arsenal of democracy". The term "arsenal of democracy" referred to the supply of "implements of war", primarily to Great Britain, and the need for war production. FDR also spoke of the devastation caused by the Luftwaffe Blitz on London. Fireside Chats Fact 18: On December 9, 1941, two days after the Japanese attack on Pearl Harbor (December 7, 1941), President Roosevelt announced the Declaration of War with Japan. FDR urged the nation to steel itself for casualties and sacrifices. He emphasized that Germany and Italy were also grave threats to America but stopped short of declaring war on these two nations. 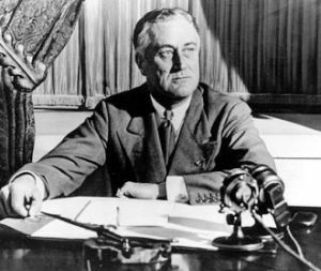 Fireside Chats Fact 19: On Tuesday, May 27, 1941, President Roosevelt made what would be the longest of his Fireside Chats, in the Proclamation of Unlimited National Emergency. In his chat FDR vilified the Nazis and called for Americans to “take loyal part from this moment forward” in the war effort to help the Allied Forces. He asserted that the U.S. has not declared war, but was fully involved in aiding its allies. Fireside Chats Fact 20: The Map Speech: On Monday, February 23, 1942 reported on the progress of the War and asked American families to have a map to help follow the references he would make to different countries - it would be referred to as the Map Speech. The war was not going well for the Allies at this time, but instead of hiding this from the nation he approached the subject with honesty saying "...your government has unmistakable confidence in your ability to hear the worst, without flinching or losing heart." Fireside Chats Fact 22: On Friday, December 24, 1943, after his extensive trip through the Middle East and the Mediterranean, President Roosevelt reported of his successful meetings in Cairo and Teheran with Churchill, Stalin, and Chiang Kai-shek. Fireside Chats Fact 23: On Monday, June 5, 1944, on the eve of D-Day, the president enthusiastically announced the Fall of Rome, but reminded Americans that there were more confrontations ahead. Fireside Chats Fact 24: Monday, June 12, 1944 was the last of the fireside chats by President Roosevelt, in which he spoke about the progress of the war and urged all Americans to buy war bonds. Fireside Chats Fact 25: The end of the war in Europe was in sight but on April 12, 1945 President Franklin D. Roosevelt suddenly died from a massive cerebral hemorrhage. Vice President Harry S. Truman was left in charge of a country that was still fighting the Second World War. The article on the Fireside Chats provides detailed facts and a summary of one of the important events during his presidential term in office. The following Franklin Roosevelt video will give you additional important facts and dates about the political events experienced by the 32nd American President whose presidency spanned from March 4, 1933 to April 12, 1945.